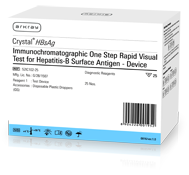 Crystal HBsAg (Device/Dipstick) | ARKRAY, Inc.
Immunochromatographic Test for Qualitative Detection of Hepatitis B Surface Antigen (HBsAg) in Serum or Plasma. Combination of highly specific monoclonal & polyclonal antibodies. Detects all 4 subtypes and 11 serotypes of HBsAg (Ad & Ay) as well as all mutant strains. Analytical sensitivity > 0.5 PEU/mL.